Organize and transform your entryway or mudroom with our Amish Traditional Storage Bench. This bench is available in two sizes. Bring us your ideas and custom furniture requests on this storage bench or any of our Amish furniture. We want to create that special heirloom furniture to turn your home into a beautiful place for friends and family. We are proud to offer only American made furniture at Dutchcrafters. This beautiful Amish Storage Bench will bring style to your entryway, foyer, laundry room or mud room. It’s so nice looking and can actually be a stylish addition to any room in your home or office. There is plenty of storage room for your coats as well as your hats, gloves, bags, purses, gardening supplies, toys in this solid wood storage bench. Choose to add Amish made baskets as well to keep your clutter hidden from view. This hall bench or mudroom bench is available in several wood types and finishes to fit the décor of any home. 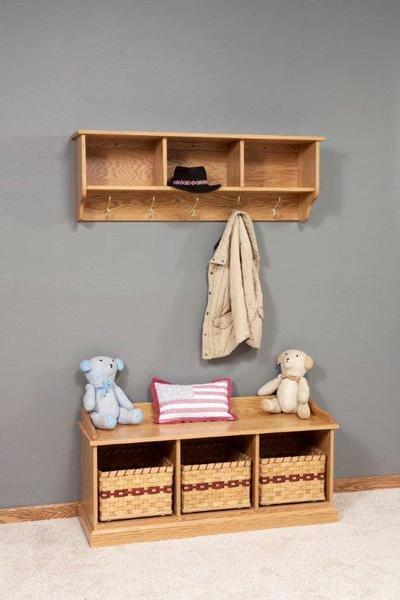 Hall storage has never been so easy or attractive with this Amish made Storage Bench. This solid sturdy Amish bench is also a perfect seating option for putting on your shoes or pull off your boots. You can even store your shoes inside the storage bench!